After visiting rural Ethiopia, and witnessing first-hand the challenges that women and children go through looking for water, Italian architect Arturo Vittori was driven to help. His solution, a clever machine, made of bamboo and banana fiber twine, which harvests between 50 and 100litres of water per day from the atmosphere. 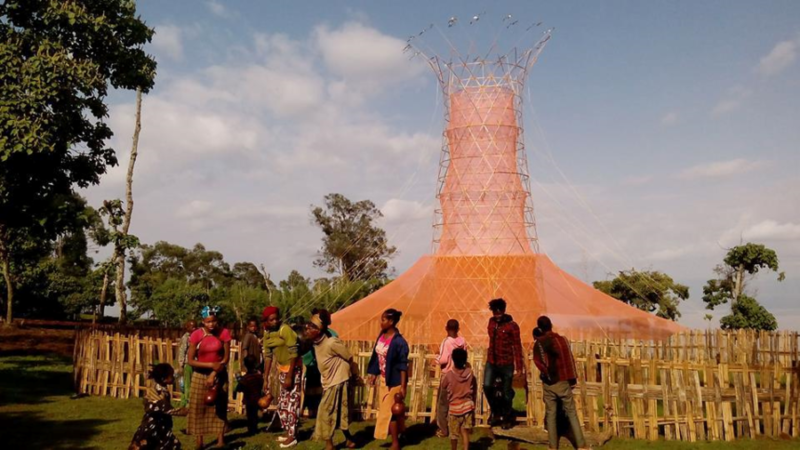 The Warka Water is a vertical structure designed to convert fog and dew into potable water. The system does not require electrical or mechanical power to run and is driven by the natural forces of gravity, condensation and evaporation. The Warka’s water harvesting technique and construction was informed by ancient technologies, performing similar purposes. Archeologists recently found structures from South England, which were designed to collect water by condensation, some of which are still working. By studying the Namib beetle’s shell, the lotus flower leaves, spider web threads and the integrated fog collection systems in cacti, the engineers identified various materials and coatings that can enhance dew condensation and water flow. The woven pattern of the tower’s bamboo structure mimics the style of other structures in the region, incorporating a familiar aesthetic. The system has four main components; the mesh, which traps water from the fog, the collector that also acts as a condenser and the collection tank.